These three new awards, known in the industry as the “Oscars” of advertising, digital marketing and public relations, bring the total for the Destination to six: two gold, two silver and one bronze. 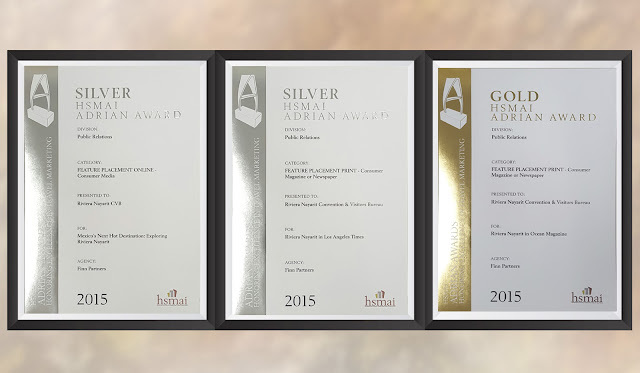 The Public Relations department of the Riviera Nayarit Convention and Visitors Bureau (CVB) and Finn Partners, its agency in the US and Canada, received one gold and two silver recognitions during the 2015 HSMAI Adrian Awards, which given in acknowledgment of the “best of” for the previous year. The awards are presented by Hospitality Sales & Marketing Association International (HSMAI), and they’re known in the industry as the “Oscars” of advertising, digital marketing and public relations. The gold was awarded for an article about the Riviera Nayarit published in Ocean Magazine in the Feature Placement Print category, one of the silvers was for USA Today’s “Mexico’s Next Hot Destination: Exploring the Riviera Nayarit” in the Feature Placement Online category and the second silver award was presented for the article on the Riviera Nayarit in the Los Angeles Times, also in the Feature Placement Print category. With these three new awards, the Destination now has a total of six to its name: two gold, three silver and one bronze. The other three awards were received as follows: gold in 2014, bronze in 2013 and silver in 2009. The winners were chosen from among approximately one thousand candidates from 30 countries around the world, less than a third of which won gold. HSMAI has been awarding these recognitions for the past 59 years, which is a testimony to their importance and credibility.